Quagga mussels (top row) and zebra mussels (bottom row). Photograph courtesy of the National Oceanic and Atmospheric Administration, Great Lakes Environmental Research Laboratory. Nonnative zebra and quagga mussels (Dreissena polymorpha and Dreissena bugensis, respectively; see photo above) were accidentally introduced to the Great Lakes in the 1980s and subsequently spread to watersheds of the Eastern United States (Strayer and others, 1999). The introduction of Dreissena mussels has been economically costly and has had large and far-reaching ecological impacts on these systems. 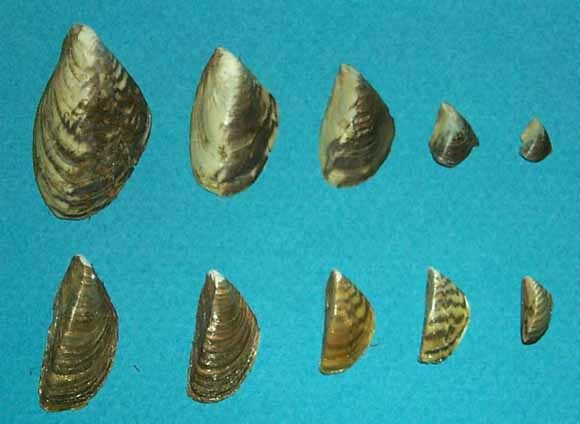 Quagga mussels were found in Lakes Mead and Havasu in January 2007. Given the likelihood that quagga mussels and, eventually, zebra mussels will be introduced to Lake Powell and the Colorado River at Lees Ferry, it is important to assess the risks that introduction of Dreissena mussels pose to the Colorado River ecosystem (here defined as the segment of river from just below Glen Canyon Dam to Diamond Creek; hereafter CRE). In this report, I assess three different types of risks associated with Dreissena and the CRE: (1) the risk that Dreissena will establish at high densities in the CRE, (2) the risk of ecological impacts should Dreissena establish at high densities in the CRE or in Lake Powell, and (3) the risk that Dreissena will be introduced to tributaries of the CRE. The risk of Dreissena establishing within the CRE is low, except for the Lees Ferry tailwater reach where the risk appears high. Dreissena are unlikely to establish at high densities within the CRE or its tributaries because of high suspended sediment, high ratios of suspended inorganic:organic material, and high water velocities, all of which interfere with the ability of Dreissena to effectively filter feed. The rapids of Grand Canyon may represent a large source of mortality to larval Dreissena, which would limit their ability to disperse and colonize downstream reaches of the CRE. In contrast, conditions within the Lees Ferry tailwater generally appear suitable for Dreissena establishment, with the exception of high average water velocity. If Dreissena establish within the CRE, the risks of negative ecological impacts appear low. If Dreissena are able to attain moderate densities in Lees Ferry, estimates of filtration capacity indicate they are unlikely to substantially alter the composition (e.g., nutrient concentrations, suspended organic matter concentrations) of water exported from Lees Ferry. Further, a moderate density of Dreissena within Lees Ferry may actually increase food available to fishes by increasing habitat complexity and stimulating benthic production. If Dreissena attain moderate densities in the CRE mainstem, which seems unlikely, ecological impacts will probably be comparable to Lees Ferry—an increase in benthic production. Dreissena may have ecological impacts on the CRE, if they become established in Lake Powell and substantially alter the composition of water released from Glen Canyon Dam; however, it is unclear whether changes in the composition of water released from Glen Canyon Dam will have a net positive or negative impact on food availability in the CRE mainstem. The risk of Dreissena introduction to tributaries appears low. None of the tributaries have upstream lakes or reservoirs that could actually serve as a source population for Dreissena; reservoirs on the Little Colorado River may eventually support Dreissena, but they are far up in the watershed and the segment of river connecting them with the mainstem CRE is intermittent. If the CRE mainstem is colonized by Dreissena, there are no significant vectors for transporting them upstream into the tributaries. In addition, lethally high summer water temperatures make it unlikely that Dreissena will establish in many tributaries. Lake Powell is a logical focus for management and research efforts, given that maintenance of Dreissena populations within the CRE will require an upriver source population and the uncertainty associated with the downstream impact of changes in Lake Powell water quality.